The Frankenstein Chronicles: Series 1, Episode 4 - "The Fortune of War"
The gothic images on display in this week’s episode are what you get when you stare into the darkness and the expelled afterbirth of humanity oozes back at you; prepare to get closer to the horror of The Frankenstein Chronicles. Subtitle: Series 1, Episode 4 - "The Fortune of War"
I’ve seen things in "The Fortune of War"; things that are now seared into my retinas and playing with my optic nerves like a string accompaniment at a baroque ball. Or, more accurately, like cacophonous bells at my own rain-sodden funeral, with myself being buried alive, scratching at the coffin lid from underneath; because the gothic images on display in this week’s The Frankenstein Chronicles are what you get when you stare into the darkness and the expelled afterbirth of humanity oozes back at you. As I’ve said before, the show unsettles through period atmosphere and character intrigue, but there are at least two scenes in this week’s episode that were visually affecting to the point of staying with me well beyond what I would call a comfortable amount of time. I applaud the show for pushing itself further into disturbing gothic territory. Retrospectively, it actually feels like the first half of the season was almost a leisurely preamble, a tasting plate of sorts, designed to attune the viewer to the grim baseline reality of bleak Georgian life, before plunging deeper and further into the sewers, both hands out, and squelching sludge (or what you hope is sludge) in your fists. The episode literally opens with a journey into the fetid tunnels of London, which ended with me being mildly traumatized and astounded by how, in what could have easily been a throwaway scene, brilliantly the scene was handled. The underbelly’s metallic oxidized-green patina is hauntingly infused with the flickering orange hue of Marlott’s (Sean Bean) lamp. There are rats, and there are shadows, and there’s a stench, which belongs to the leather-masked criminals that emanate from the waste, putting a knife to the adventurer’s throat, and demanding immediate satisfaction. I was drawn into the squalid scene through the outstanding costume and set designs, and was deeply impressed by how intense the morbid atmosphere became when, startlingly, out of the center of the frame steps a woman, dressed entirely in funereal black, with a grimy black-veiled face offering a pair of floating orbs for eyes and nothing more. Whether this woman was in mourning for life, or married to death, I couldn’t say, but when talk turns to why Marlott needs a fresh corpse "for company", it says something that necro-paeodophilia almost lightens the mood, because at least the subterranean ghouls can be bartered with; their last tangible link with humanity. Marlott isn’t really interested in acquiring a mortified playmate; he’s on the trail of Billy “The Child Snatcher” (Robbie Gee) -- who Marlott suspects took Alice (Jessie Ross) -- and those that were responsible for artificially recombobulating the disparate limbs of other equally unfortunate kids. To that end, Marlott has two plans; either Pritty the grave robber (Charlie Creed-Miles), finds the people that are a part of the chain, or Marlott uses the newly returned Flora (Eloise Smyth) as an enchained lure for something despicable. One plan is reasonable and relatively safe, whereas the other idea is clearly where the narrative was always hurtling itself despite the protestations of rationalized logic and the potential for collateral damage. One might question Marlott’s wisdom in bringing Flora into the fray, as she’s abruptly returned from the allegedly palliative hospitality of the enigmatic Lord Harvey (Ed Stoppard), minus the unborn-child she was carrying; but, as Marlott makes it clear: "She’s ours, she’s here … we’ll use her!" Without being bait, Flora’s already of use to Marlott and his virtuous mission, but the Inspector is still blinded by his assignment and the emotional encumbrances that are weighing him down. Flora is the only person working on assembling Blake’s painted images -- and whilst Marlott is out chasing culprits, her work is rudely interrupted by the prime suspect. Flora’s scene could have been played quite perfunctorily to show the young girl’s weakness within the patriarchal system, but again, the scene is elevated through a refined understanding of the horror genre that’s sparingly deployed in the middle of the police procedural actions whirling into place. Flora hears a noise outside her bedroom, and creeps out towards the camera; then, in a reverse shot, Billy steps into the center of the shot, elevated above Flora, backed by bright light and not even deigning to look down at her, like a gross parody of Victorian silhouette portraiture. Flora stumbles backwards in abject terror, mouth and eyes wide open, grabbing a knife from the kitchen table, whilst Billy smoothly glides into her personal space, tells her that he’s "got a use for" her, doffs his hat, laughs with all the sonorous bass of a projected cackle from Hell itself, and leaves in what may as well have been a wisp of smoke. Eloise Smyth and Robbie Gee have just made Oliver Twist and Fagin’s relationship look like an advertisement for the Perfect Adoption Agency by comparison; were I wearing one, I would doff my own cap (but it would probably give Flora PTSD). It’s a question of semantics just how much this objectification differs from that of Marlott’s hold over Flora. Billy has selfish means, whereas Marlott’s quest to find Alice has become a warped redemption quest designed to ameliorate the agony over losing his own child. Therefore, whilst Flora would prefer to stay with Marlott, she’s not exactly at the top of the pecking order (even though, like Marlott, she’s also lost a child). Thankfully, after last week’s Bad Romance, Nightingale (Richie Campbell) seems to have also restrained his own desire for “pecking” Flora this week. To understand how Marlott’s visions are more important to him than either Flora or reality itself, we only have to look at this week’s hallucination of his deceased wife, which to my mind replicates the Pre-Raphaelite painting of Ophelia by John Everett Millais (circa 1851), with its fragile lady in white laying composed, beautiful, and ultimately dead in the stream after heartbreak and "female madness" have consumed her. This idealized portrait is immediately contrasted by a flashback to the grim reality of his wife’s death, with her being unceremoniously fished from the water, and Marlott falling to his knees pleading for forgiveness. Yet, whilst Marlott has cryptic waking dreams, including seeing Alice at a ruined abbey (could it be the one that Lord Harvey operates from?) as she sings a reprisal of "Oranges and Lemons" from last week (also, how does Billy know to sing this song? ), as both Nightingale and the audience finds out, the reality is that Marlott’s madly barking at an empty chair and nothing more. We’ve all been there, I’m sure. Marlott’s drug-induced visions have coaxed him in the past, but they are no substitute for the signs that are already before him, such as -- I don’t know -- Lord Harvey’s controversial comments that abortion can be "a blessing in disguise" for poor people, or his further explanation that the Galvanists -- which includes Sir William Chester (Samuel West) -- "believed they had found the source of all life". Also of note in this episode is the small interaction between Sir William and Lady Harvey (Vanessa Kirby) -- when he touched her arm I kept shaking my head until the scene ended. In fact, I’m doing it now just typing this. I should probably see a Doctor if it continues. The third quarter of “The Fortune of War” is fully given over to Marlott’s scheme to find the monsters that are creating and supplying dead children in London. It feels like a macabre version of the board game Mouse Trap, if there was a Rube-Goldbergian variation that dealt in shady taverns, child prostitution, and murder. In every episode that’s preceded this one, Nightingale has been tasked with tailing a key suspect, and in every case he’s failed in one way or another. By every metric measurable, he’s bloody useless at his job. So, when Nightingale has to follow Flora in this week’s episode, in a matter of life or death, we can finally understand and appreciate why Nightingale’s function in the story has been to be so incompetent: when it comes to the most important moment in the entire season, our usual belief in the narrative convention that “everything will be alright as it looks dramatic, but it is actually only a way of progressing the plot a few beats” has not only been thrown out of the window, but has been sent out of orbit on a rocket destined for the center of the sun. When Marlott’s held up by Billy in a fun but diversionary fight, and Nightingale starts to dither, the look of fear on Flora’s face is devastating; we know that she is statistically likely to die, and she might have just made the same calculation. Like a greedy kid in some kind of Willa Wonka’s Chocolate Gothic Nightmare, I’ve grumbled about the languorous pace of some of the earlier episodes, wanting everything stuffed in my greedy hamster cheeks as soon as possible. Yet, the pay-off in this episode is nothing short of jaw-dropping and face-slapping. Flora’s been placed on the back of a cart, and as her rickety full-mooned journey begins, taking her out of the city to the visually striking make-shift favelas and slag-heaps of the Brick Hills, Marlott’s in a desperate race to find out where she’s gone. Nightingale, on the other hand -- driven by amorous desperation, and quite possibly a general surprise at being able to finally do his job -- wades straight into the encampment, gun out and ready to execute a hostage to secure Flora’s release. The descending hoards wisely call his bluff, and although the hysterically screaming brood-mother may beg to differ, Marlott saves the day. The action within the scene is thrilling, but the emotional sucker-punch comes from Flora’s limp body, found within the brick oven. Comparisons with images from the prison camp chambers of the holocaust come readily to mind and linger uncomfortably, as prone and splayed out on a pillow of indeterminate grey ash, Flora’s companions are scores of dead bodies; skeletal but with the skin stretched over them like emaciated leather mannequins, frozen in the defeated posture that they probably took when they uttered their last prayer after realizing that nobody was going to rescue them. This grueling scene becomes even more poignant as it’s revealed to be a fruitless investigatory cul-de-sac -- just Georgian life as usual -- given that the Bishop family’s "trade is killing" but they "ain’t ever killed no children", the episode moves out into the daytime air for a brief retch and respite, but also to progress other threads of the narrative. Boz (Ryan Sampson) takes it upon himself to publish a front-page article for The Morning Chronicle, entitled: "The Frankenstein Murders. Composite corpse found by river police"; which not only references Mary Shelley’s "blasphemous text" and mentions that Marlott “may have answers”, but also directly ruins Sir Robert Peel’s (Tom Ward) intentions to keep the matter hushed until either the Anatomy Act is passed, or a person of low social rank can be found to shoulder the blame. This will all have ramifications for Marlott and the political aspects of the show to come. 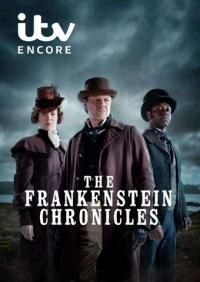 At the end of an episode in which positive actions became futile and dangerous events, Mary Shelley (Anna Maxwell Martin) resurfaces at the estate of a deceased "James" to casually drop some revelatory bombs on proceedings. Mary finds a grieving figure in mourning garb, calling her Mrs. Hogg (although I may have misheard her) -- which ties in with the opening scene of the episode, but also, given that their exchange is about Mary driving James to suicide, and Mary replying "I only meant to honor James in my book; I was very young when he died. We knew not what we were doing" -- one wonders who this James was, and what they were “doing”. Some possible candidates might include Thomas Jefferson Hogg, who was a close friend and biographer of Mary’s husband, Percy Bysshe Shelley; however, he died in 1862, 35 years after the year in which The Frankenstein Chronicles is set (1827). A more suitable figure might be Dr. James Lindt, who was not only a mentor in natural science and philosophy to a young Percy Shelley, but actively pursued countless experiments in galvanism. Lindt is therefore often credited as being the man who indirectly taught Mary most of the medical science that was present in her novel. He also died in 1812, which would put his death four years before Shelley began work on her book in 1816; about spot on time-wise. Of course, as with the Dippel connection from last week, finding the historical figures behind their onscreen names might amount to nothing directly impactful; just tasty flavoring to the Georgian broth. Yet, as Mrs Hogg describes how she burnt all of James’ possessions, and Shelley becomes alarmed at hearing that shady Sir William has visited James’ laboratory only the previous day, the final images of Mary, walking past a large brass piece of scientific equipment to pull back a sheet to another room, and revealing a surgeon’s table with fresh blood spattered in wet pools on the floor, tells us that we’re only just beginning to get to the heart of the real Frankenstein story: the horrors of “The Fortune of War” were just the prelude.